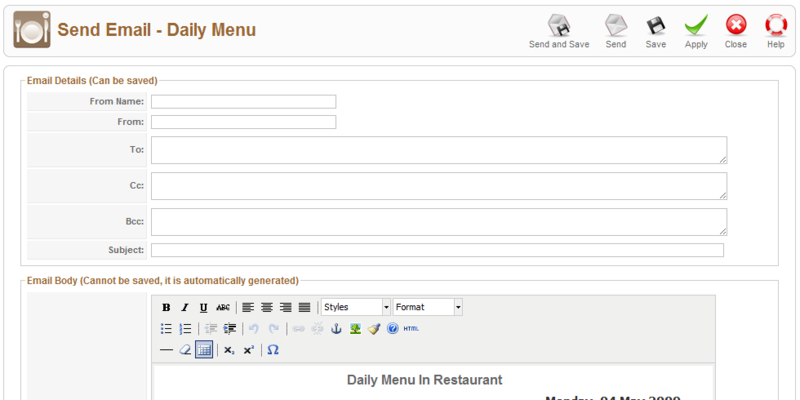 Created menu can be sent to customers via Email function. You can set the Email Settings in Global Configuration in Joomla! 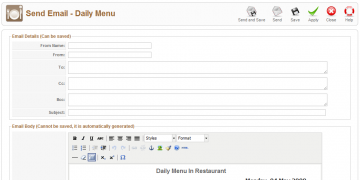 If you are able to send emails from your site and you have created some menu in Phoca Restaurant Menu, go to Components » Phoca Restaurant Menu » e.g. Daily Menu. Click on Email icon which you can find in Toolbars. From Name - set name which will be displayed as "From"
Subject - set "Subject" for the email message. Email Body - this information cannot be saved here as it is automatically generated from the menu. It is the main menu text which will be sent to customers. Help - URLs to Phoca Restaurant Menu guide, main site and support site will be displayed in Help window.